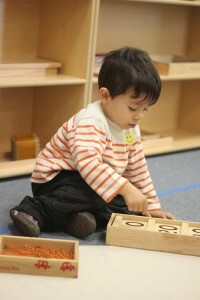 The Bridge Primary program at Hudson Montessori is designed for transitional two and a half year olds to prepare them for the order and structure of the Primary program. The Bridge program follows the curriculum of the Primary program, adjusted to the early learning level of the younger three year olds. Most children in this program are born between the months of October and February. 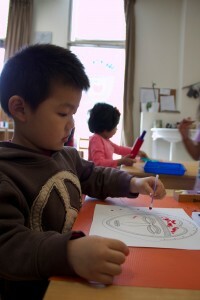 The Bridge program provides these young three year olds a gentle connection between home and school. The children’s first experience to a group setting in this smaller environment is tailored to each child’s unique developmental needs and interests. Each child’s natural need to explore and experience at this young age is supported by a careful selection of materials to encourage them to learn about themselves, while mastering developmental milestones such as sharing and taking turns. The young children’s drive toward independence is supported by giving them time to finish and repeat a work until they feel satisfied. The carefully prepared environment offers them a sense of order and predictability, enabling them to satisfy their natural curiosity and need for exploration. Children learn to take care of themselves and their environment while engaging in practical work they often see their parents do at home. The pride and fulfillment they feel when mastering these tasks is celebrated daily in the classroom. Similarly, children learn to respect themselves and others while solving conflicts through our daily peacekeeping techniques. Their developing language skills are celebrated by giving them ample opportunity to practice conversation and speaking in front of their friends. The classroom environment is designed for the children to feel safe and feel their uniqueness and individuality is nourished and supported.